Some days are just so amazingly wonderful that you just wish you could wake up and do it all over again. 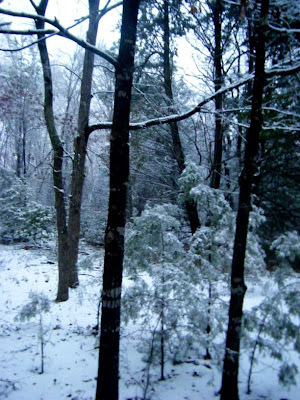 I knew it would be just such a day when we woke up to a dusting of snow. Now I realize that to many of you, a "dusting" of snow is not noteworthy, but for us it is a real treat. If you look very closely at the photo below, you will see what a small amount of white stuff it takes to get our attention. 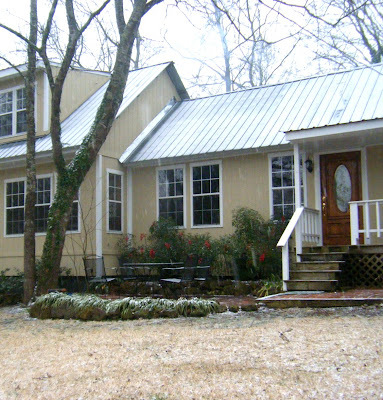 To make the day even better, I was headed to day 2 of a 4-day silversmith workshop held at Beulah Land, a local B&B. 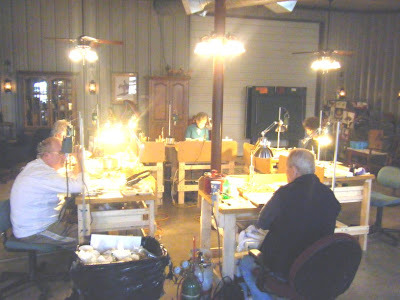 (http://www.beulahlandranch.com/ ) This is my first experience in silver jewelry formation and I am loving it! Our instructor, Mr. Dan Haga (http://danhaga.hagaweb.com/ ) is a gifted artist and teacher and our hosts, John and Sue Carlson are nothing short of wonderful. As we worked on our projects today, I had a hard time not gazing at the snow that continued to fall, but I did manage to finish a pair of earrings and a bracelet. I'll post pictures in the next few days! Finally, as if this day wasn't great enough already, the snow began to accunmulate as temperatures dropped this evening so I ended the day with a snowy walk in our woods with my son. What could be better? That looks like so much fun! It makes me happy when you're happy! Enjoy! Me too! I looked at his site... beautiful work.